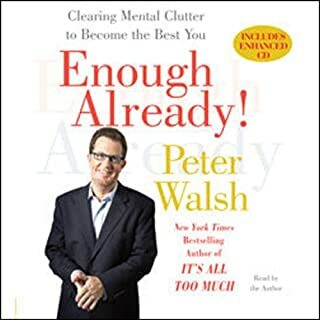 In his previous best-selling books, Peter Walsh helped audiences successfully get rid of the clutter in their homes, on their bodies, and in the six key emotional and spiritual areas of their lives. 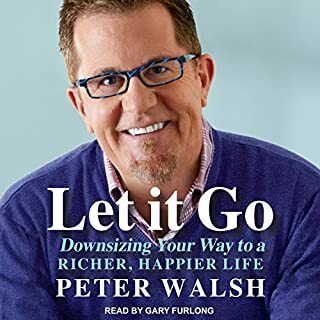 Now, in Lighten Up, Walsh explores what happens when the clutter is finally gone and shows listeners how to let go of wanting more and learn to live a richer, fuller life with what they already own. ©2007 Peter Walsh. All rights reserved (P)2007 Simon and Schuster Inc. All rights reserved. This was my first audible, and I can't believe what a positive impact it has had on my life. 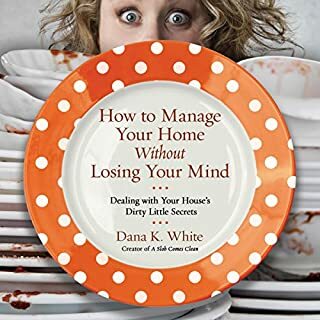 The author is the narrator and he takes you step-by-step through your house helping to understand why you may be keeping "stuff" and how to divest yourself of it. I have donated tons to charity and still have a ways to go to declutter my life, but I listen to him over and over again to reinforce what he's imparting to me. Proof that it works...I went to Ireland last week and each time I was thinking of getting a "dust collector", I looked at it carefully and set it in my mind as a memory and then put it down. I was so proud of myself...thinking I saved myself from having to deal with more stuff when I got home. 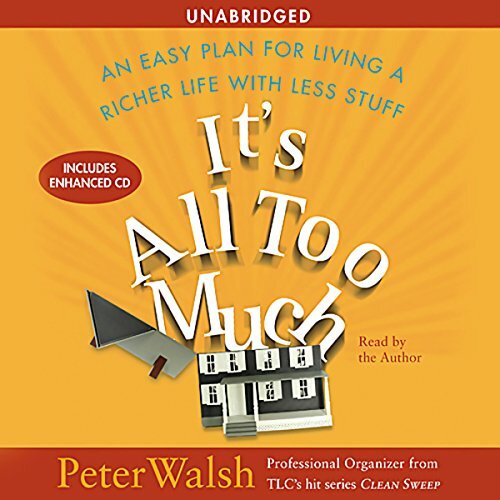 If you have a cluttered home, this audio book is a winner! I've tried clutter book after clutter book (laughing as I see them all cluttering up the bookshelf, heheh) and this one is the one that has changed me the most. Unlike most clutter books, it's not simply how to organize or simply the psychology of why we clutter - instead it iss equally "WHY we clutter" and "HOW to get rid of it and keep it from coming back". I love it. If you've ever seen Peter on TV and thought, "I need him to come to my house", this is your chance. The audio version is perfect, you can start tossing your clutter while you're listening. Get a big box of trash bags and a few tissues handy as he takes you step by step through every room of your home. Wow, this book takes you beyond organization, it helps explain why we do the things we do! Amazing. Loved the book and loved the narration. 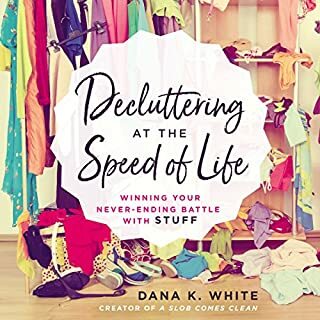 If you've got to deal with clutter, this book will motivate you. Its great! This book is more valuable than gold. Truly. It contains hours of immeasureably useful coaching advice and knowlege concerning our relationship to our "stuff." It's narrated by the author in clear, natural way, and written in a manageable style. It lends itself easily to stop and start listening. Peter Walsh is experienced and honest. His true gift lies in making people aware of their emotional life in regards to their material possessions. Possessions is a good word; espeically as Americans, we seem possessed by our things, instead of being in charge of them. All this junk weighs us down in ways I hadn't thought of until Peter pointed them out. Our crap casts a magical pall over us. Peter breaks that spell. He punctures our self-deception, showing us how this stuff wouldn't be here if we hadn't let it. The glory of this book is not just how he points out WHAT is wrong, it's when he points out WHY. Why did my life get like this? He takes all the reasons people give (read: excuses) for why they keep drowning in their cluttered lives. He exposes the underbelly of those reasons. He's incredibly enlightening when he's revealing the many hidden personal costs behind our clutching, hoarding behaviors. He is kind but remorseless in helping people to see what it costs to live like they do. Then he helps you fix it. His book is a good balance between large ideas and a detailed program of change. If you follow it, you will invariably find your life changes for the better. Note: he WILL insist you get rid of things. He doesn't flinch from calling it as he sees it. And he's seen it all, as he makes clear. His message: don't be owned by your things. Live your life in a way that flows naturally from the choices you make first about how you want to be. Then learn to relate to your stuff in a way that fits those choices. Don't let your knick-knacks choose for you! Own your own life. A final note: get the audiobook version--it takes up less space! An approach that makes sense. Goodbye cluddah. Liked it. Am cautiously optimistic Walsh's approach might do the trick for me. The book is not much about getting organized. The focus is squarely on the how, what and why of getting rid of stuff. Since listening I've gotten rid of considerably more stuff than I've taken in...without regret. So far, so good. Usually I don't mind and sometimes even prefer a reader's British (or in this case Aussie) accent, but the accent makes the word "clutter" come out "cluddah". You hear the word pronounced like that 500 times and it might get annoying. But maybe that's not so bad though cause now when I see clutter I hear cluddah cluddah cluddah in my head, which annoys me and maybe helps me want to get rid of the stuff. I think Walsh is on point and he definitely deserves a listen. If you feel you have no control in your life anymore, if everything seems too much, if you want your life back, then this is the book for you. An easy read, did not want to go back to my life until I finished. So I put most things on hold,(cept hubby and kids) and found time to read it back to front. Have downloaded it as well from audible.com and now listen to it as much as I can. I now understand why my life is so chaotic and have now found peace in areas as I go about de cluttering and feeling space. Works a treat, so easy (apart from the actual cleaning up and chucking things out - bloody hard work - set realistic goals. Highly recommend to everyone. Now I see life clearly and my relationships have improved all around at home. There are many books out there that can tell you how to organize but not many that also tell you WHY you accumulated the clutter in the first place. This book hit the nail on the proverbial head and I found myself nodding yes over and over again to the authors statements. Just learning to organize is not going to do you much good unless you are given tools to help you not make the same mistake twice. Case histories abound which made me feel a bit less like a freak and more like someone with a deeper wound I tired to heal with 'stuff.' I can't thank the author enough for setting me on the right track. 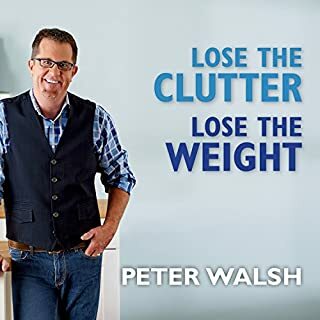 Peter Walsh helps you figure out why you have to much stuff encourages to you free yourself from stuff you don't really want or need and coaches you to enjoy and live your life without being buried under the junk we collect. 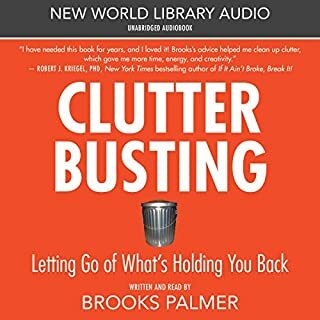 Outstanding book on motivating you to NOT KEEP SO MUCH STUFF ! We all know that we need to get rid of stuff and get organized but need the motivation and passion to actually get it done. This book is a great motivator. I also advise to listen to The Now Habit by Dr Fiore. Both of these books are different. The book by Dr Fiore is more about procrastination and taking baby steps in getting things accomplished. I have given these books as gifts and they are both well received ! Some books are best listened to and both of these are more effective in the audio version versus print. Good luck with your self improvement! Want the goal MORE than what is keeping you from it ! Peter Walsh narates his book with great enthusiasm. I found it very interesting and a book that I will no doubt return to again and again. After only the first third of the book I was hooked and spent the next 2 days sorting out the horror of our house - the study bedroom. All done now and packing the car for the tip trip. A pile of lovely things to take next door for the children there. Now there is one room in the house that I like and can go to build the energy to tackle the rest. I don't feel overwhelmed any more and my goal is to create a home where I am not embarrassed to let people in. Don't hesitate, just download it. I loved all the tips in this book, and I really love his Aussie, laid back but no-nonesense approach. Thank you, Peter! I will be buying life experiences from now on. Loved the personal experiences and emails too. I love Peter Walsh's no no-nonsense approach and real-life examples. I play his audiobook before I embark on my next decluttering exercise and then I have it going while I am in the doing of the job at hand! It keeps me on track.